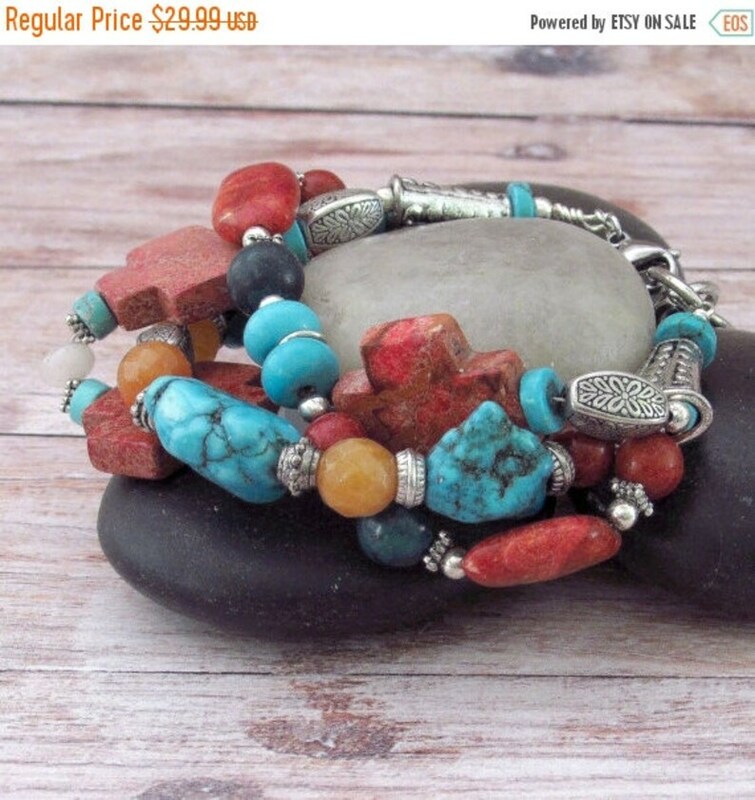 The vivid color combination of Turquoise, Imperial Jasper, Agates, Red Coral, Howlite, Magnesite, Glass, Aluminum and Silver Plated Pewter accents echo the American Southwest in this lovely layered gemstone bracelet. Each strand of this bracelet has been individually strung and attached to the clasp. The strands were then twisted around each other for a unique look. You can thread the ends of the bracelet through the strands of beads for a more twisted look which will actually shorten the length of the bracelet. One of the three strands of this layers bracelet feature three red Imperial Jasper crosses. The standout styling of this beautiful gemstone hippie bracelet will be sure to grab attention no matter what style of outfit you choose to pair it with. Complete your bohemian wardrobe today with one or both of these beautiful country western bracelets. Every cowgirl needs this lovely bohemian bracelet in their jewelry collection. Even the pickiest of boho mamas will enjoy this bracelet. Although two are available, this listing is for ONE (1) bracelet only. If you desire them both, go ahead and treat yourself. The length of this bracelet measures approximately 8 inches (20.32 cm) with a 2 inch (5.08 cm) extender chain. Thank you for choosing Raziela Designs for all your Bohemian jewelry needs.